Plot Summary: Lawrence Craft is a twenty-five-year-old merchant. His main goal in life is to gather enough money to start his own shop, and he already has been traveling for seven years while gaining experience in the trade. 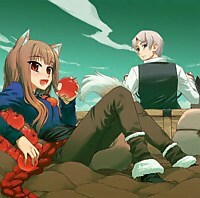 One night when stopped at the town of Pasroe, he finds a 250-year-old pagan wolf-deity girl named Horo sleeping in his cart. She appears to be a fifteen-year-old girl, except she possesses a wolf's tail and ears. She introduces herself as the town's harvest goddess, who has kept the area blessed with good wheat crops for many years. Despite having the responsibility to watch over the town, she wishes to go back to her homeland in the north called Yoitsu, since she believes that the locals have forsaken their past agreement and therefore she is no longer bound to their land. She makes a deal with Lawrence to take her with him in exchange for her wisdom and supernatural abilities, but as they travel, her true nature draws unwanted attention from the church.